The consolidation of the food industry spares no quarter, including brands that are known for their small size and independence. Large food-processing companies are buying up organic brands, as the market for products made without synthetic pesticides and fertilizers continues to grow. The latest consolidation on this list was Earthbound Farms, a packaged produce company, acquired by WhiteWave Foods earlier this year. 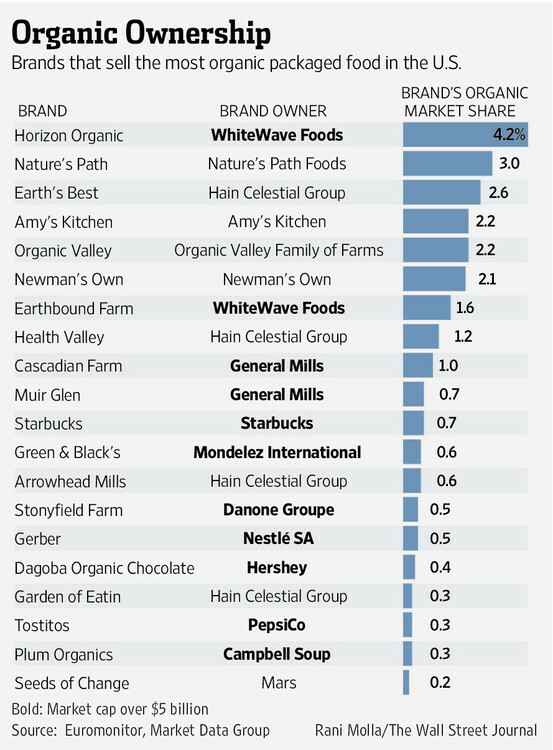 WhiteWave, in turn, had been spun off from dairy giant Dean foods the year before. Growing up on our farm in the ’40’s and ’50’s, I learned from Dad how to nourish our soil with seaweed, crop rotations and deep mulches that produced abundant fruits and vegetables that were the envy of farmer neighbors – all without chemicals. He taught the importance of always leaving the soil better—thus informing the way I endeavor to lead our family enterprise. We can think of topsoil as a bank where we deposit for our future, and make periodic withdrawals in the form of quality food. By creating and maintaining good soil through sustainable practices, our precious planet can continue to sustain life indefinitely. Healthy soil = healthy plants = healthy people. It’s that simple. Unfortunately, that virtuous cycle is no longer the norm. Modern agriculture wages war against Nature with a vast arsenal of genetically modified crops, toxic herbicides and pesticides, with littlethought for the future. Millions of tons of herbicide and pesticide residues, feedlot runoff and excessive use of fertilizers seep into the arteries of our land: the creeks, rivers, water wells and lakes, leaving a trail of pollution, loss of species and ultimately creating dead zones in our seas. Toxins inevitably end up in our food chain, severely impacting the quality and duration of life. There’s a high price for mass produced, cheap food. spring, one could feel the earth energies flowing both ways, up through the feet and back to the land. You can smell honey within 15′ of the hives, and my girls (the bees) were busy making the best of the sun. ‘s Hand is immanent in all.